Microscan announces that its MicroHAWK Platform has been honored with a Vision Systems Design Innovators Award for innovation and service in the vision and image processing industry. Microscan imaging platform, MicroHAWK, honored by bronze-level award in Vision Systems Design Innovators Awards program. Microscan, a global technology leader in barcode, machine vision, verification, and lighting solutions, announced today that its MicroHAWK® Platform was recognized by the judges of the annual Vision Systems Design Innovators Awards program. The judging panel consisted of esteemed experts from system integrator and end-user companies. Microscan was honored with a bronze-level award for its innovation in barcode reading and machine vision as one unified solution in the MicroHAWK platform of smart cameras. From the invention of the first graphical machine vision user interface to the creation of the Data Matrix symbol, Microscan’s innovation in data capture and inspection technology continues to integrate more comprehensive, user-friendly tools into increasingly powerful, miniaturized platforms. The breadth of Microscan’s barcode reading and inspection capability comes together for the first time in MicroHAWK, the world’s smallest imager suite designed for both auto ID and machine vision. MicroHAWK simplifies the process of choosing automation equipment – offering high-performance barcode reading, product tracking, traceability, verification, inspection, gauging, and guidance on a single smart camera platform. This is made possible through MicroHAWK’s configurable software and hardware options, which meet any price and performance requirement. Users can choose from a range of features from basic decoding to advanced machine vision, selecting their preferred sensor, optics, speed, and lighting to be integrated into the MicroHAWK device with the ideal dimensions, connectivity, and industrial rating. Intuitive software interfaces balance functionality and usability for new to experienced operators, giving every user the power to accomplish imaging tasks with the fastest out-of-box setup experience available. Of the Vision Systems Design Innovators Awards, Alan Bergstein, publisher of Vision Systems Design, states, "This prestigious program allows Vision Systems Design to celebrate and recognize the most innovative products and services in the vision and image processing industry. Our 2016 Honorees are an outstanding example of companies who are making an impact in the industry." 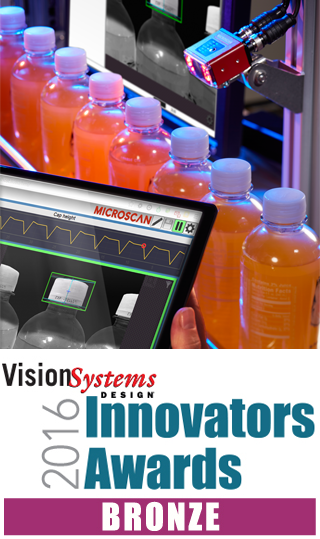 The 2016 Visions Systems Design Innovators Awards Honorees are featured on the June Issue of Vision Systems Design magazine as well as on http://www.vision-systems.com. For more information about Microscan’s MicroHAWK Platform, visit http://www.microscan.com/microhawk. Microscan Microscan announces that its MicroHAWK Platform of industrial imaging devices has garnered an award in the Vision Systems Design Innovators Awards program.Microscan announces that its MicroHAWK Platform of industrial imaging devices has garnered an award in the Vision Systems Design Innovators Awards program.